MEXICO CITY — Sixty-seven years ago in Mexico City, a Stalinist assassin plunged a pickax into Leon Trotsky's skull. The Bolshevik revolutionary died in exile from the Soviet Union. During the latter part of his three-year stay in Mexico, Trotsky lived with his wife, grandson and a team of security guards in a small compound surrounded by high walls in Coyoacán, a bourgeoisie neighborhood in the southern part of the Federal District. Nowadays, Esteban Volkov Bronstein, Trotsky's grandson, helps run a museum in the former abode, which attracts an eclectic mix of curious tourists — usually in the area to visit the nearby Casa Azul, artist Frida Kahlo's longtime residence — and idealistic lefties, who pay their respects on the anniversary of the attack by laying flowers at the hammer and sickle-adorned mausoleum in the garden. 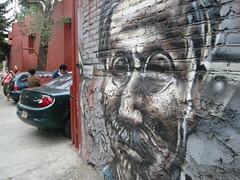 Alberto Fonseca, a philosophy professor at the Autonomous University of Mexico City, has visited the Trotsky Museum on Aug. 20 — the day Trotsky was assassinated — for 12 consecutive years, delivering a speech that highlights the aspirations of modern-day revolutionaries such as Hugo Chavez, Evo Morales and Fidel Castro, to a small group of communists sporting Marx and Lenin pins, and leading an off-key rendition of the Internationale, the communist anthem. Although Trotsky lacks the present-day stature of Ernesto "Che" Guevara — who Fonseca described as a "sexier" icon — the Ukrainian-born revolutionary has enjoyed a modest surge in popularity in recent years. The hit 2002 movie "Frida" portrayed moments from Trotsky's Mexican sojourn, including his supposed affair with the film's namesake — an event Volkov doubts. He explained that the guards, who accompanied his grandfather around the clock, said it couldn't have occurred without their knowledge. "I never found out until I read it in a book," he said. He conceded, though, "(Kahlo) had a great capacity for seducing men. "She was a little spiteful towards Diego (Rivera) because he often deceived her." In his day, Trotsky, famous for his trademark round-rim glasses, disheveled hair and goatee, dominated one of the feuding streams of international communism. A disillusioned George Orwell wrote "Animal Farm," a stinging rebuke of revolution run amok, after barely escaping a purge by Stalinist thugs during the Spanish Civil War. Like Snowball, the well-intentioned pig from Orwell's novel, chased off the Manor Farm by a ruthless rival, Trotsky went into exile after losing a power struggle with Soviet tyrant Joseph Stalin, bouncing around Europe for nearly a decade, constantly staying one step ahead of ever-present assassins. Mexican President Lazaro Cárdenas granted Trotsky asylum in the 1930s at the urging of Diego Rivera and members of the Mexican Communist Party. Upon his arrival, Trotsky found a country full of revolutionary fervor. During Cárdenas' six-year reign, he nationalized the Mexican oil industry, openly supported the Republican side in the Spanish Civil War and redistributed millions of hectares of hacienda land. Trotsky initially lived with Rivera and Kahlo in the Casa Azul until ideological differences with Rivera — and not an affair with Kahlo — forced the revolutionary to move. Volkov arrived in Mexico in 1939, having lost virtually his entire family. His father disappeared in a Soviet gulag. His mother committed suicide in 1933. A sibling was left behind in the Soviet Union. Because of his frequent moves, Volkov pretty much lost his ability to speak Russian. He lived with his grandfather for a little more than a year, surviving a "well-planned" machine gun attack on the Coyoacán house led by famed muralist David Siqueiros, a Stalinist. Volkov survived by hiding under his bed. Some of the bullet holes still riddle the museum. But Ramon Mercader, a Stalinist agent, infiltrated Trotsky's inner circle. He carried out the dirty deed as Trotsky reviewed documents supposedly penned by the attacker. Volkov stayed in Mexico after the attack, living in Coyoacán and working as a chemical engineer, but he never became politically active. In his retirement, he's kept his grandfather's legacy alive through the museum. But decades after the assassination, some bitterness remains. "In mere seconds, (the assassin) liquidated one of the best minds of the Marxist revolutionaries." A very nice essay. Is it safe to wonder again what Leninism (or Marxism) might mean if Trotsky had lived?